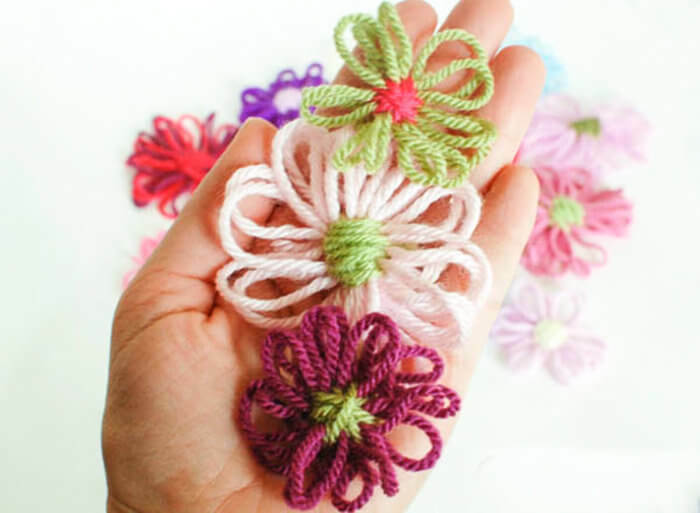 These pretty loom flowers are so quick and simple to whip up! All you need is a round loom, some leftover yarn, and a tapestry needle. 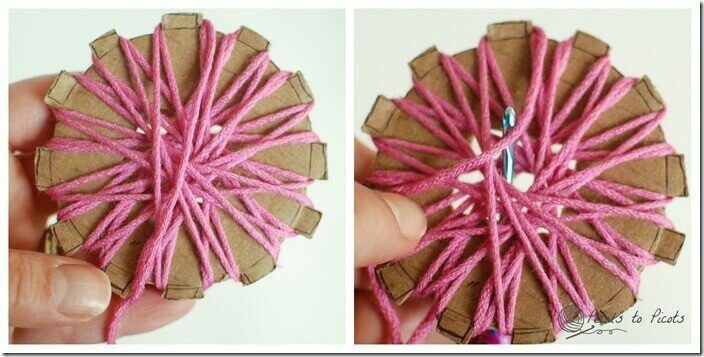 You can make the flowers with a store bought round loom like this one from Clover or you can easily make your own flower loom with the template provided below. 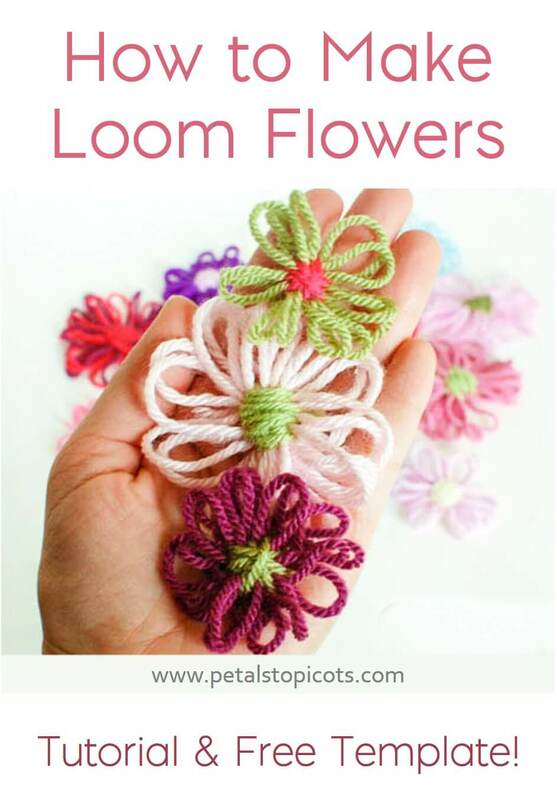 Whether you go with a store bought loom or make it yourself, the process of making loom flowers is the same. In this post I will walk you through how to make your own flower loom, as well as how to make flowers on a loom. 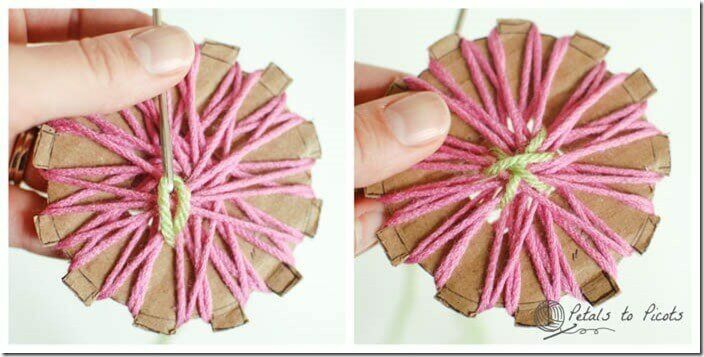 If you already have your own loom, you can just skip down to the flower how to part. 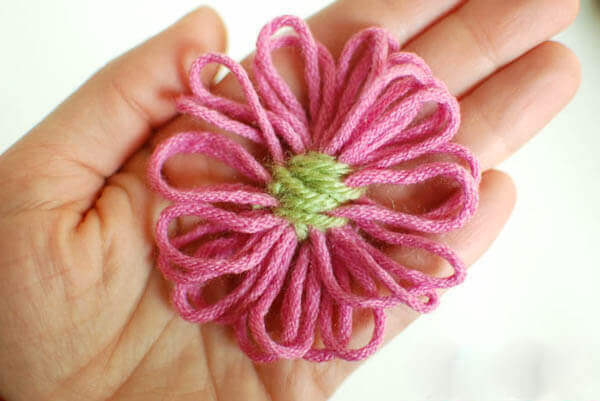 These yarn flowers are perfect for embellishing anything from baby hats, to scarves, to Spring and Easter decor! 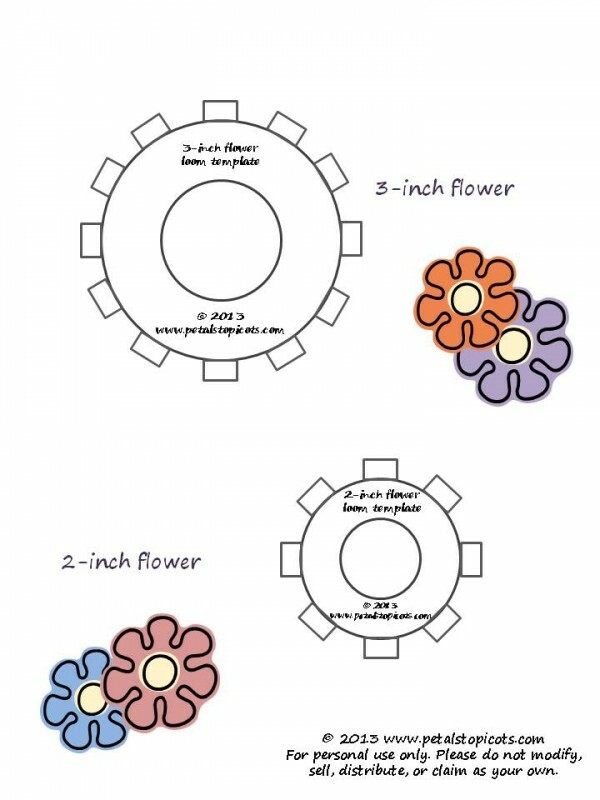 The template provided below makes two loom flower sizes … 2-inch flower and a 3-inch flower. First you will need to download and print the loom template. Click here or on the picture below. 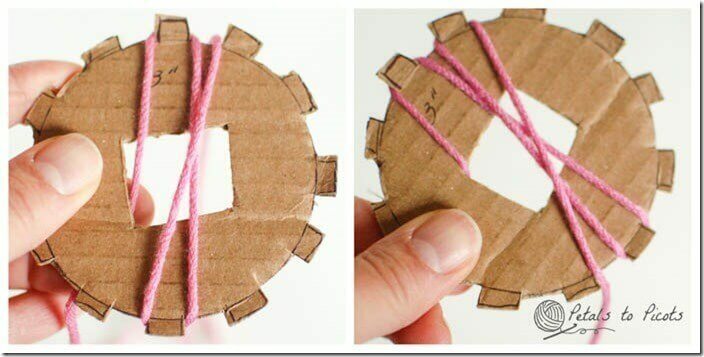 Once printed, cut out the desired loom size then trace the shape onto a piece of cardboard or plastic. 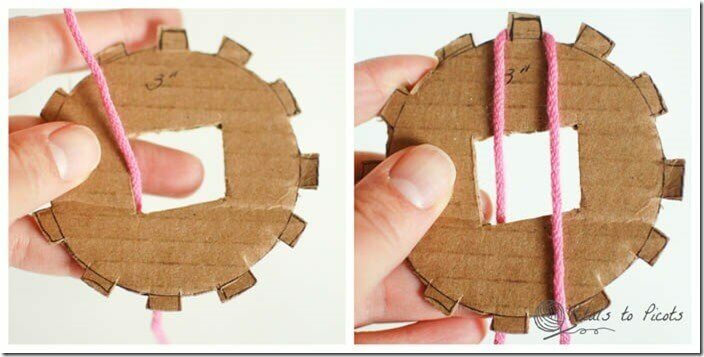 Cut out the shape, including the center hole from the template. To start, insert the tail end of your yarn through the center of your loom and place a finger over the tail to secure it. Then, wrap the long end of your yarn around the top tab. Wrap the yarn around the tab on the opposite side of the loom. Working clockwise, wrap the yarn over the next tab and down again around the opposite tab. Continue wrapping the yarn around each tab and its opposite around the loom and repeat for a second pass. There should be two loops around each tab when you’re finished. Leaving a tail of a few inches, cut your yarn and use a tapestry needle or your hook to pull the tail through the center. Tie a knot with the two tails behind the loom to secure. 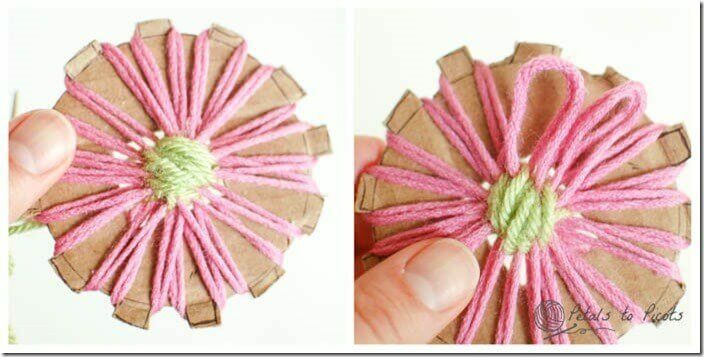 Use a coordinating color to stitch around the center. Starting from behind the flower loom, use a tapestry needle to make crisscross stitches to secure all the petals. Continue stitching until the petals are secure and until you like how the center looks. You can continue with the crisscross pattern or finish off by making all your stitches in one direction. You can even use a third color to make an accent stitch around the center. Once your finished with your center, pull the thread to the back of your flower loom and knot with other end to secure. Now gently pull the loops off each tab. And voilà! You have a pretty loom flower! So quick and easy that you can whip up a bunch in no time at all! I think I want to use these to embellish my burlap wreath from Valentine’s Day. What do you think? Find more free crochet flower patterns here. I’d love to make an afghan out of these for my birthday. Thanks. Thanks for the tutorial! I have been looking for a simple, airy flower for some time now! These are so cute. What would be the best way to attach these to something, like a beanie hat for example? I wouldn’t want it to lose it’s fluffy look. Hi Linda 🙂 I would sew them on, concentrating mostly on the center. Hope that helps. I had to make a loom flower and I find you! How luky I am! Both the tools and tuto. Thank you so much! Ooooh … Can’t wait to see them! Kara, what a great tutorial! Pinned it! I love this! So great! Thanks so much for linking up on Hookin On Hump Day! I recently got a loom flowers magazine and though of ordering a little loom through e-bay or etsy, but here you are with this wonderful tute!! Such a wonderful little project! Love it’s simplicity. And you ALWAYS take such beautiful photos! Thanks for a sharing a great idea! Lovely flowers! Thanks for the tutorial! They would bring colourfulness and happiness to any project. I don’t mind at all 🙂 thanks Pam! A fab tutorial, not only the info but the pictures too. Generous of you to share, thanks for that! Ooooh !! Nice little flowers !! !